Maintaining lawns is a necessity for owners of both residential and commercial properties. 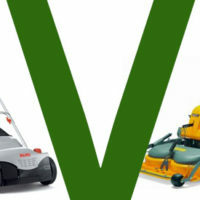 Both parties might find themselves considering the benefit of a manual mower vs. a ride on mower, and the question of which is superior comes down to a number of factors. Manual mowers have been around for about two hundred years, but today the old cylinder variety has been replaced by gasoline and electric models. Gasoline mowers are more powerful and can cover more distance, but they are loud and can cause pollution. A corded electric mower doesn’t have these problems but the distance it can cover is limited by the cord, and manoeuvrability can be an issue. Cordless electric models are the simplest and most efficient to use but can come at a slightly higher price tag. Regardless of the model, manual mowers share some common strengths. They are small and easy to transport, and are generally easy to manoeuvre. They are often the best choice for small lawns, such as those attached to residential properties. They are much cheaper than ride on mowers, and a home owner can easily store one away when it’s not in use. The first ride on mowers were produced in the 1920s, and became immensely popular for maintaining large, commercial properties. The chief advantage of the ride on mower is that it can cover more ground more quickly, and doesn’t need to be propelled by human exertion. For these reasons, ride on mowers are more suitable for large areas, such as golf courses, or any property with extensive grounds. They aren’t however as manoeuvrable in small spaces as manual mowers are and they are also much larger so take up more space while in storage. They come at a higher price tag, but are far more effective at maintaining large properties. As well as the property that needs to be maintained, the requirements of the person using the mower need to be taken into consideration. An elderly person or someone who can’t be on their feet for long periods of time might be more inclined to purchase a ride on mower, even for smaller residential lots. They can look for smaller ride on mowers to meet their needs. Both manual and ride on mowers have their advantages, and anyone looking to purchase one should weigh their own abilities along with the nature of the property in question. For more information on the different types of mowers, don’t hesitate to get in touch with our team here at The Mower Shop or alternatively browse our website to find a model to meet your needs!